← Southwestern Layered Beef Casserole. New Music From Young Braves. 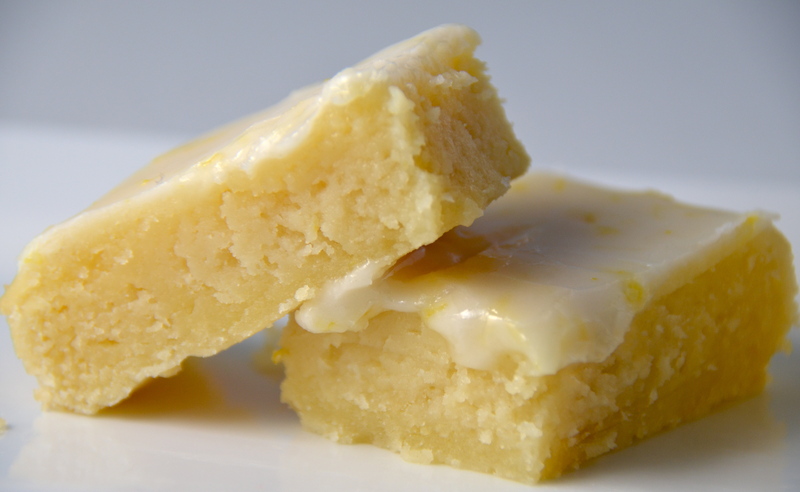 Not quite a lemon bar, not quite a brownie, these little bites of sunshine get the cute name Lemonies. Packed with lemon flavor and topped with a tangy glaze, they are a real sweet treat. 1. Preheat oven to 350℉. Grease an 8-inch square pan or line pan with non-stick foil. 2. Mix flour, sugar, salt, baking powder and zest together using a wire whisk. 3. Add melted butter, lemon juice, eggs and vanilla and stir until completely combined. 4. Pour batter into pan and bake for 20-25 minutes or until a tester inserted in center comes clean. 5. Remove from oven and cool. 6. 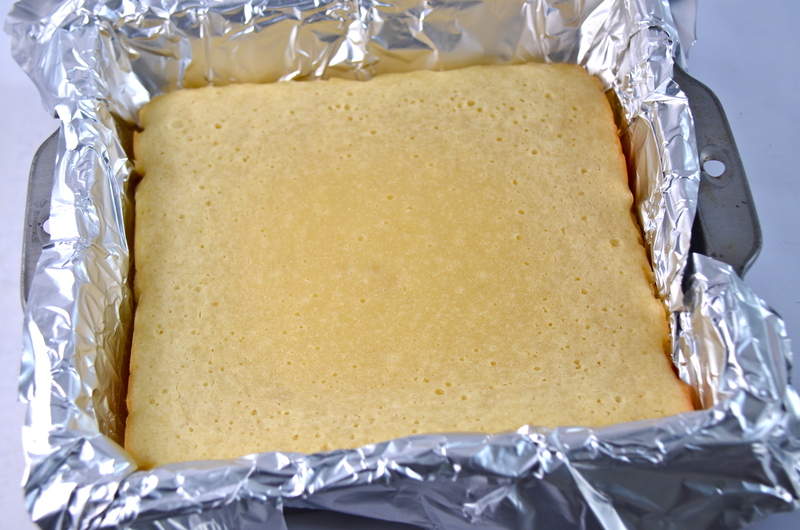 Pour glaze over the lemonies and allow to set before cutting into 25 bars. 1. sift sugar into a medium bowl. Add lemon juice and zest and stir until combined and smooth. A little bit of lime to go with our lemon. Lime Cordiale, that is. Their new EP “Falling Up The Stairs” is packed with hopping, neo soul tunes. Can’t stay still when it’s playing. Check out Lime Cordiale on their Website, where you can learn of upcoming West US tour dates and buy the music. This entry was posted in Brownies, Dessert and tagged Lime Cordiale. Bookmark the permalink. 104 Responses to Lemonies (Lemony Brownies). Awesome New Music From Lime Cordiale. Thanks so much! Once you catch up on your sleep you need to try the recipe. It’s so good. Really really good found this from pinterest! I’m so glad you liked the recipe. Thank you for letting me know! I’m curious do u know the calorie count? I found this page which lists the calorie count as 148 if the lemonies are cut to yield 16 pieces. The recipe I made uses 1/4 cup more butter which adds 407 calories and 1/2 cup more of confectioners’ sugar which adds 233 calories. So recalculating, that would add 40 calories to each lemonie for a total of 188 calories for 1/16th of the recipe. I serve really small pieces (so that the recipe yields 25 lemonies) so, using the math above, the calorie count for a lemonie would be 120. How do you cut 25 ‘lemonies’ from an 8 inch square pan? You need an even number and 25 is not an even number. I made 5 cuts across and 5 cuts down to come up with 25 squares. You can certainly slice them larger or smaller to get an even number. Hi. Is it plain flour? In the UK you have either plain or self raising. Also is it vanilla paste or something else? Hi Susan, thanks so much for stopping by! Just made this afternoon the batter and glaze tasted delicious but they came out kinda flat. How “high” should they be? I agree that they are a bit on the flat side. Mine were very dense (compact deliciousness!) and were probably a little over an inch high. This recipe is a winner I bake it several times a month. Everyone that I bake it for family, friends, customers, neighbors and my boyfriend, they love it and can’t get enought of it. Also, I do use oranges with this recipe and it is the bomb. Thanks so much for letting me know! Yum…Orangies! Almost didn’t follow up on the music link in anticipation of being Rickrolled. Are these easy to double to bake in a 9×13 pan? “You should go by the area of the pans. Based on that it looks like it is worth a try to double. You’ll have to let me know how they turn out! Okay, I baked these this week and thought I hadn’t cooked them long enough but nope, they were perfect! They are a little flat as you said but the consistency is great! And wow, they are lemony delicious!!! Everyone loved them! I’m baking another pan tomorrow! Thank you for the recipe! Love these Lemonies! Have a question about cooking time. First time I made them they were still pretty jiggly in the center at 25 minutes so baked another 5 minutes, then 5 more minutes and just beginning to brown around the edge so I took them out. Once cooled, I realized that the center was not cooked (but my husband ate it anyway). Next time I baked for 23 minutes and started checking – adding 10 minutes, then 5 minutes and still needed 3 minutes more. I’m wondering what the reason might be? Oven is calibrated correctly. Would the size of the eggs make a difference? Whatever the reason – we love these and take them to parties all summer long! Hmmm. I’m not sure what the reason is. I looked around the comments section of the post where I got the recipe and only 1 person out of about 87 commenters had that issue. Glad they still tasted good!! I had the exact same problem! I wish I could figure out why! Hi Christy…..bake until knife comes out clean from the centre….simple as that. Come by your site on an late friday afternoon relaxing looking at Pinterest, spotted this pin for the lemoney lemon brownies from Pinterest, got off couch and started baking, I pin a lot and bake little, Thank you, the cake was received very well especially for been Friday and I end up cooking dinner for the family instead of take out. Will be baking this again and hopefully a lot more. Just made these this morning and they are scrumptious!! They will be a family favorite!!! I was surprised at how good these were! I was actually looking for a brownie recipe when I found these on Pinterest, and let me just say, all chocolate plans went out the window — these Lemonies really hit the spot!! I love the texture and the bright flavor! I’ll definitely be making these again! I am so glad that you like them! Thanks for letting me know and for stopping by. Have you ever tried adding blueberries to these? Sounds intriguing. I have not but I bet it would be da Bomb! Are these able to be made in advance ? How long does the glaze need to “set” ? The lemonies stay fresh for up to 4 days stored in an airtight container. The glaze set up in about 2 hours for me. My kitchen was pretty warm as I baked them on a June day. is it safe to double recipe? I think it should work fine if you double it and bake in a 13 x 9-inch pan. Let me know how they turn out if you try. I was looking for a Thanksgiving recipe, and I stumbled across this god of a desert! My entire family says it looks AMAZING, and I am desperate to try them! Thank you for making these!! I think you are going to love the lemonies! Happy Thanksgiving and thank you so much for stopping by. I follow the Trim Healthy Mama lifestyle and used almond flour, xylitol for the sugar ( you need only about 1/2 of what it calls for for the icing), lemon extract because I was out of zest. The flavor was perfect!!!! I was craving lemon. They don’t act like they’re going to stay together, though. They are cooling in the frig. I’ll eat them with a spoon if I have to they are so yummy. Any tips for getting them to hold together?? I’ve never baked with a sugar substitute so am not sure how texture is affected. 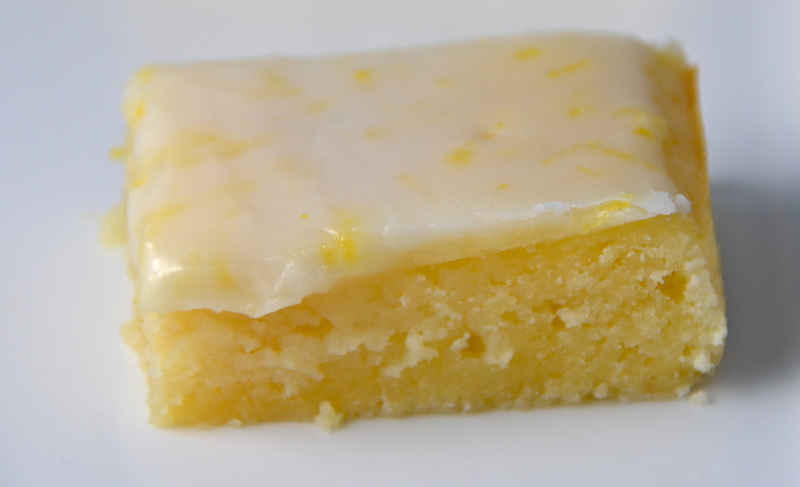 The Lemonies are very pudding like made according to the original directions, but they do hold together. You’ll have to let me know if the refrigeration helped at all. At least they are tasting good for you! I made this recipe with limes and it was even better! 25 minutes in the oven at 350 and I could pour it out like water. I double and triple checked to make sure I followed the recipe exactly. Waiting to see if more time helps. Crossing my fingers. Did they ever set up for you? I had 2 other comments related to this and there was no issue related to oven temperature or egg size. So, I am not really sure why this happened. I hope they finally turned out alright! hi there :) i didnt have my 8×8 pan avail. so went w a 9×5 and i knew would take bit longer but when they finally got done,.just shear lemon joy in my mouth thank you so much!!! Baked these for a company carry-in… and what a hit!! I doubled the recipe and baked in a 9×13 pan, had to add about 10 minutes but they were perfect!! I brought home an empty dish with tons of compliments!! Thanks for a great recipe!! These smell great, I changed the flour to 1/2 cup almond meal and 1/2 cup whole wheat flour. The sugar I used 1/2 cup coconut sugar and 1/2 cup rapadura cane sugar. The glaze I used the confectioners sugar, but I made about 1/2 the amount. They are great! I like the changes you made! Glad that they turned out great. Thanks so much for letting me know. I just made this with my 5 year old. She asked me to make it again tomorrow. She is currently licking her plate clean. Pingback: When life gives you lemons? Make dinner, dessert and cocktails! Do you sift the flour or no? Thanks! Baked these for work and followed the recipe as is . i did add blueberries and they make it super delicious! They are always a big hit and my staff requests more! Thank you! Yes!! Thanks so much for letting me know. Adding blueberries sounds absolutely awesome. I must try that. This recipe is amazing. I used Gluten free flour & Stevia and turned out delicious. Thank you so much for sharing & for the music selection. Love Love Love!! Do these bars have to be refrigerated? The lemonies stay fresh for up to 4 days stored in an airtight container. You can refrigerate them if you like (they are delicious cold from the fridge, too! ), but they are fine on the counter. I made these for the first time last night. I used limes instead of lemons (because I had some already) doubled the recipe, and used a 9×13 pan. I.also added a few drops of green food coloring, just for a more fun, lime-like look :-D They are super delicious! I think when I make these again I’ll use the single recipe for the icing, even though I’ll probably always double the rest. I did cook them just a tad too long, but it doesn’t even matter. The crispy brown edges are super yummy! Thanks for sharing this recipe. I made this yesterday – it was just what I’d hoped for when I was looking at recipes using lemons. When I made it I used 4 tablespoons of fresh squeezed lemon juice (one more than what the recipe called for) because I wanted it to be really lemony. It turned out awesome. I also made the glaze extra lemony – the glaze really is a great enhancement. Also, I made it in a round glass pie pan because my square pan was being used – I think because I did this I had to cook it about 9 minutes longer and even then it still could have used a few more minutes – but I’d rather error on the side of undercooked than over cooked so no complaints from me. Don’t make this if you don’t have self control because it is crazy good and you won’t be able to put it down. Can I use a substitute for the eggs my daughter has a egg intolerance. I made these exactly as the recipe called for but the didn’t raise very much. They do have good flavor though. I am baking for my daughters wedding and was thinking about making these but was wondering instead of making them into bar cookies do you think they could be put into tassie pans to take away the need to cut them into squares??? That is an intriguing idea, but to be honest I have no idea how they would turn out. Since it is for a very special event (!!!) you would want to be absolutely sure. I looked around the internet and all I saw were lemon curd type tassie recipes. Certainly sounds good, but would not really have the same texture as the lemonies. If you experiment and it works, please let me know! And many congrats on your daughter’s upcoming wedding. That is really exciting. Doubled the recipe, no problems and oh my gosh so delightful……. Thank you so much for sharing your substitutions to make the recipe vegan. Excellent! A friend and I are currently making the lemonies ! We are in Europe and only found patisserie flour in our kitchen …. 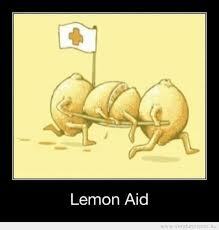 would that effect the outcome of the lemonies ? You go European baking gals! I am almost positive that the patisserie flour will be fine. It is only 1% off in protein content from all purpose flour. I’m making these for the second time. The only adjustment I’ll make is that I’ll bake them a little longer and use less of the glaze. I crave citrus ALL THE TIME and after reading some of these comments will have to try making them with lime and orange. Great recipe. Thank you! 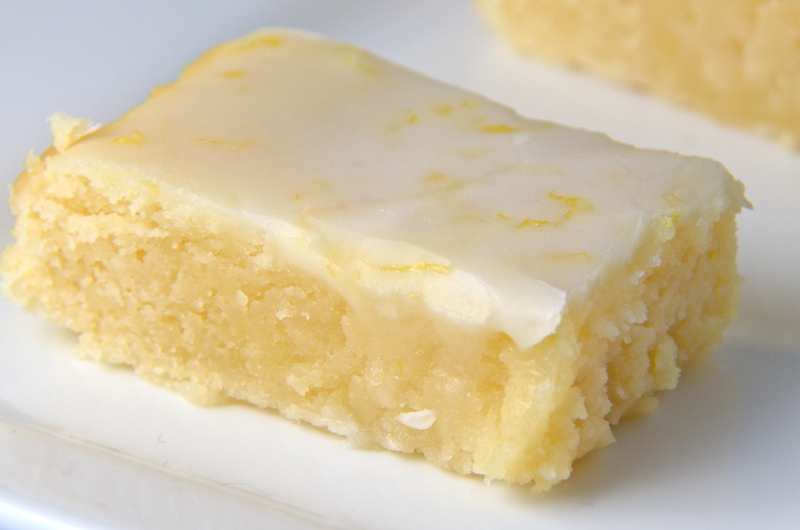 I was looking for a lemon bar recipe when I found these and I’m so glad I did! Super easy and delicious. Recipe doubled well. I will definitely make these again! My mom sent me this recipe a year ago with a box of citrus. I have been making this recipe ever since! I have tried with oranges too and they are divine! I love the alternative to the normal chocolate brownie. And my favorite part is the glaze. I did add a splash of lime juice to the glaze as well. Yummy!!! OMG what a delicious “lemony” recipe! Lemonies is the perfect name for them! This is better than any lemon bar. It’s perfect! Dense, moist, delicious and a wonderful combination of sweetness and tart. Yummmmy. Lemon lovers, add this recipe to your collection. Hi Joanne! I found this Website with a very similar lemonie recipe. And it looks like the answer is YES! Stacy, the author, gives detailed instructions for freezing.